Being a homeowner of your own house, bring a lot of confidence, a security and a roof over our heads. Investment Property for the salaried person or a small businessman is a dream. Most of us priorities the house in our Financial Goal. Planning to buy a house is a very difficult decision to make, but is buying a house a good idea? Certainly, there are some reasons, we shouldn’t avoid before planning on buying a house. Looking to buy a house, but there are reasons not to buy a home, in this article you might change our mindset towards the approach. Down Payment is basically the booking amount and treated as advance as confirmation to the seller. In normal circumstances the down payment is 10% to 20% of the house cost, which need to be paid from our own pocket, rest amount would be converted into Loan from financial institutes. Every country had their own credit rating agencies, which calculate the credit rating of every person. During mortgage/loan before sanction from the financial institutes or Banks, credit score is mandatory. 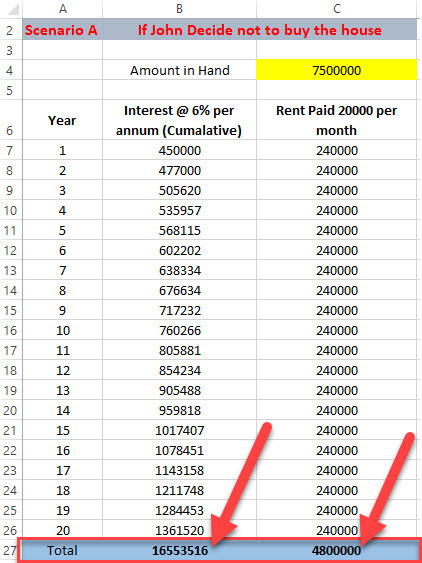 This score decided whether the applicant is eligible for the Loan or not, If yes the interest rate and the fee is decided accordingly. Nowadays the financial institutes or banks need to sanction the loan amount according to the premium. The premium will not eat about 50 % of the Gross income of the applicant, even if the applicant is eligible for more loan amount. The Debt ratio needs to be very low. The applicant needs to be aware of the job changing and transfer, it is not the good time to buy the house. The unemployed person fixes their priorities like grocery, medicines expenses etc, instead of paying an installment of the house. The wrong decision and timing tend to go deeper into Debt. If we enjoy changing jobs and the City for new experiences. It is better not to buy a house. It is difficult to build assets in the City and sell it at a very low price or loss just due to changing Job. In metro cities, single people buy a house with its partner or spouse, both rely on the income of each other, One pay the mortgage payment and other runs the house. If in any circumstances the relationship in jeopardy. It is very difficult to survive and the house needs to be a short sell. Buying a house or planning to buy a house is not only putting a roof over our head but on the other hand its an investment. People who buy a house in decline market put down 20 % and if the market falls another 5 %, it would be 25 % of your investment. Why buying a house is not a good idea? what do you need to buy property? Looking at the above scenario, above are some of the minor things, which doesn’t change our minds of purchasing the House. right! I, like to share one of my experience with you, One day two of my friends, Peter, John & I, enjoying the evening near a lake. Suddenly John asks both of us a question. He likes to buy a house, the House cost ₹ 75 Lakhs, he asks whether he go for the deal or not, although he already made his mind to buy the house and about to hand over the token money to the broker next morning. Peter, looks at the scenario in a different way and ask John to hold the deal. John asks Peter is buying a house a good idea? Financially, I also agree with Peter and we both present the decision of John in a financial way. According to the above discussion, there is two outcome. If John decides not to buy the House. 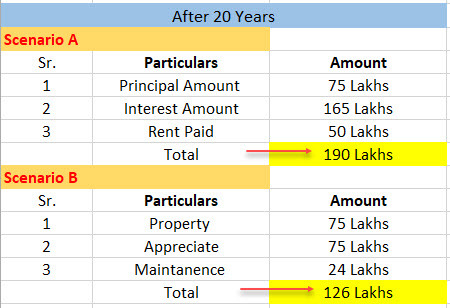 In the above scenario, it is clearly shown in the Table above, if John decided not to buy the house, the amount of money ₹ 75 Lakhs, if he simply kept the money into the bank, in return he will get the interest @ 6 % per annum (lower side). In Totality after 20 years cumulative he will earn ₹ 1.65 Cr. and the principal amount is intact. After living in a rented house for twenty years Approx ₹ 48 – ₹ 50 Lakhs is drawn from his pocket. 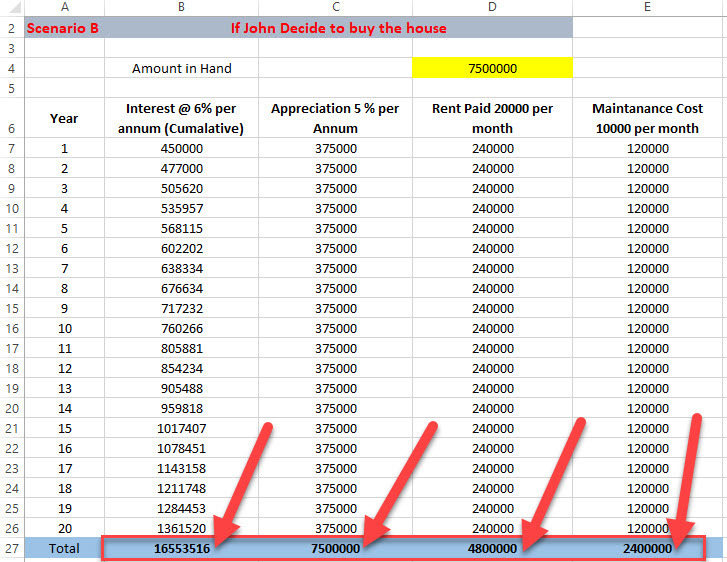 It clearly shows that John saves around a Crore and also free from Property Tax, Maintenance cost etc.. If John decides to buy the House. After buying the house John is afforded the Loss of ₹ 1.65 Cr. as cumulative interest on ₹ 75 Lakhs. but the house will appreciate by approx 5% per annum and John Property value will be enhanced by ₹ 75 Lakhs. Total value of John’s house is ₹ 1.5 Cr. after 20 years, John also has to send ₹ 24 Lakhs on maintenance. John is living in his own house that is why he also save the sum of money ₹ 48 Lakhs. If John Looks at both the scenario Financially, Scenario A will be the better choice to make money as well as live in a Big house on rent. Scenario B also bring John to the issues of Property Tax, House Insurance premium and after 20 years the house is old and outdated. After all, John decision is still unclear, but If you are in the same situation, Think Twice there is a reason not to buy a home.